I watched you tonight during your dance class, sweet girl. Don't take that the wrong way -- I'm always paying attention while you dance. Tonight, though, as I sat on my side of that mirrored window, Iyou and got a glimpse into your little world. I watched you tonight during your dance class, sweet girl. Don't take that the wrong way -- I'm always paying attention while you dance. Tonight, though, as I sat on my side of that mirrored window, I watched you and got a glimpse into your little world. What I saw as I was watching evoked a myriad of emotions that I'm still trying to sort through, hours later. Emotions in and of themselves are complex things. Trying to understand the reasons behind them is like peeling back layers from a ball of rubber bands. The outside layers are obvious enough to separate from one another. As you get closer to the core, though, the process becomes far more daunting. The bands down there are so tightly intertwined; they almost seem to want to stay tucked away deep in the middle, protected underneath the more superficial layers. In one moment, my heart is swelling with so much pride, I truly feel it might burst. There you are, standing in a circle with twelve other little girls in your class, blending in seamlessly. You're smiling, laughing, and going through the motions, right along with them. Things shift then, and moments later, I'm so anxious that I have to remind myself to breathe. Your class is lined up against the back wall as each of you wait for your turn to try a new dance move with the instructor. You follow directions and take your place in line, but then, like every week, you find yourself in the mirror. The dance class has now become background noise to you. You're busy dancing your heart out to your own music. I am not anxious for you. You are happy, and that's all I want when I bring you here. I'm anxious for me, I suppose. I hold my breath, because I wait for a question or comment about you from another parent watching the class. We've been coming to class for four weeks now, and I'm pretty sure the other parents have figured out, or at least suspect, that you have autism. Each week, the likelihood of anyone commenting on your actions probably decreases, yet I hold my breath and brace myself anyway. Your turn in line comes. You try harder this week than ever before to mimic the instructor's steps, and immense pride once again prevails over my anxiety. It's amazing to see these transitions get easier for you each time you come. Class ends, and you come out and hug me. 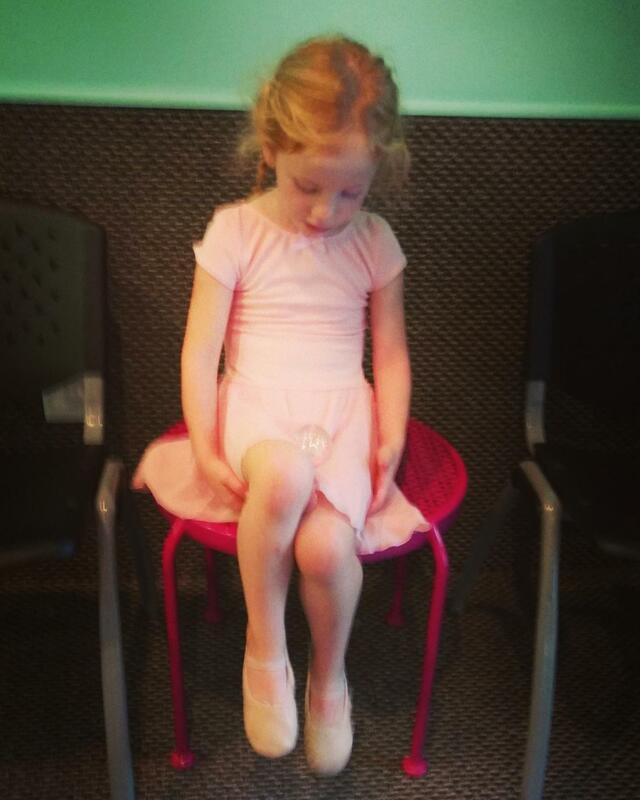 As you remove the ballet slippers and replace them with your new "rainbow shoes," a hint of sadness creeps in. It's just you and me, now. The other parents are chatting about getting ready for kindergarten as they pack up with their daughters to go home. I'm not involved in the conversation, and honestly, that's okay. I'm not here to connect with them, I'm here for you. What saddens me a little bit is that over the course of the past four weeks, I've complimented the efforts of their little girls. These other parents were here on week one, when you cried and wouldn't even entertain the idea of wearing your new ballet shoes. They were here on week two, a particularly rough week, when you put on the ballet shoes, but were too overwhelmed to finish class. They've watched you adjust and overcome things that were obviously very hard for you. Why is it that none of them have reciprocated the compliments I've given their daughters by extending one to you? Something as simple as "Great work tonight Piper!" would make you so very happy. I'm sorry no one has reached out. In one moment, my heart is swelling with so much pride, I truly feel it might burst. ... Things shift then, and moments later, I'm so anxious that I have to remind myself to breathe. They've watched you, but they haven't seen you, and that makes me sad. I wish they understood as you sit with me tonight, changing your shoes for the third time in 45 minutes, that you wore the same pair of bright pink Nikes with every outfit for nearly a year. Only in the past two weeks have you worked through the panic that the idea of new shoes has always caused you. I wish someone else here was cheering for you like I am. I understand that other parents might not know what to say to me... that they might just find it easier not to initiate conversation. Before I learned so much from you, I found myself in that situation plenty of times. I don't resent them for it. The problem is, their daughters are watching and learning from how their parents regard you. Many of them will model these very behaviors. Of any potential obstacle you could face, this is the most heart wrenching. The greatest source of worry and angst for me is the idea that because of your autism, you might be lonely. The pride I felt earlier as I watched you blend in wasn't because I wish for you to be like the other girls. You are beyond incredible exactly as you are. My pride was a result of watching you be yourself, while also watching you truly be a part of something with other children your age. I want to continue to see you involved, and more importantly, included by your peers. There are many more months of dance class. Hopefully, in time, the other parents will begin to really see you. Hopefully they will reach out. After all, a few of their daughters have begun to join you as you dance in the mirror. As it turns out, all 4-year-old girls love to watch themselves dance.